See the full list here, along with sample images from Emojipedia. More seriously, this release includes new accessibility options (people in wheelchairs, with a cane, a deaf gesture, guide dog), a gender inclusive couple, more flexible skin tones for groups, new colors, animals, a waffle, and some other odds and ends which may or may not end up being useful. Sometimes it's hard to tell. Here is today's announcement from Unicode of the release. 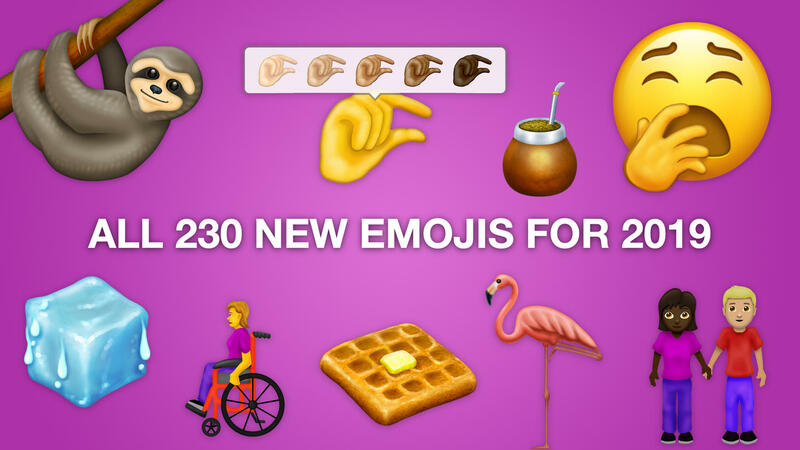 These aren't arriving on phones today, but this is your first chance to see exactly which emojis are coming to devices throughout this year. See also: thread on Twitter with new additions. We here at Emojipedia made a video showing each of the new emojis approved for 2019. These are always fun to make. Enjoy! A writeup of the notable parts of today emoji release, by me. If you just want the list, here it is. Updated charts from Unicode. Existing emojis are shown with Apple designs, and the new additions are mostly Emojipedia sample images (though there are a few exceptions in the mix). See also: today's Unicode announcement or emoji data files. Quick: which is the flag for Ireland: 🇨🇮 or 🇮🇪? A takedown of the various 🍱 Bento Box emoji designs implemented by non-Japanese companies. See also the first of a video series making each one of these bento boxes. I learned a few things here. Side-note: from this headline, it's not clear if the article is discussing one emoji or multiple emojis. One reason why Emojipedia sticks with "emojis" as plural. Occasionally I wonder if the Unicode Emoji Subcommittee were replaced with a random roll of the dice, what would the outcome be? So many emojis become popular for reasons not originally intended. In this instance, the goat for "Greatest Of All Time". Apple uses subtly different emoji names when reading them out, vs in user interfaces. I find them pretty decent to get the point across, actually! Kind of weird way to show a URL when this isn't actually an emoji domain (there are no emoji domains for .com - only obscure registries like .ws and .la). I'm always being sent news about emoji domain sales from brokers. Seemingly, a number of people saw the opportunity of emoji domains and bought hundreds (thousands?) of them, hoping to make big money from a few sales. That may end up being the case, but so far emoji domains seem to be more of a novelty than anything. "2nd​ International Workshop on Emoji Understanding and Applications in Social Media". May 13-14 in San Fransisco.